Becoming a Duke or Duchess is a grand privilege, holding the highest title of nobility. Being addressed as “Your Grace” and referred to as “His/Her Grace” comes with high status and a place in Sealand’s impressive Royal Peerage. Do want to become a Duke or Duchess of a state which celebrates uniqueness and freedom? As an independent state, the fortress island has the ability to issue legal titles so you can legally take on the title of Duke or Duchess of Sealand. Sealand is set far enough from the English coastline, outside of British waters that it is able to be its own, independent micro-nation. Your new homeland is situated around 12 kilometers off the coast of Suffolk and with claiming your new title you will receive an Official Title Pack including the Official Documents to prove your elite status of Duke or Duchess. You will be joining an impressive class; with the likes of Prince William and Kate Middleton holding the titles of The Duke and Duchess of Cambridge, and The Duke of the Normans – a title granted during the reign of Richard II. If you feel you or someone you know deserves to be considered in these ranks, taking on the title of the Duke or Duchess of Sealand is the perfect answer. 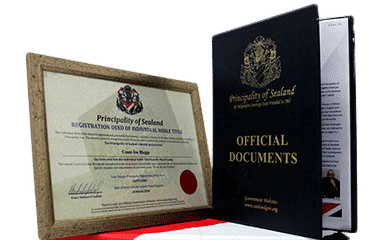 As an additional extra you can also be the proud owner of a piece of Sealand Territory, you will receive a Property Title Certificate to a Square Foot of Sealand Territory to prove your ownership. When purchasing a piece of Sealand Territory with your Duke or Duchess title you will be helping us to maintain and improve our state, keeping Sealand independent for many years to come. 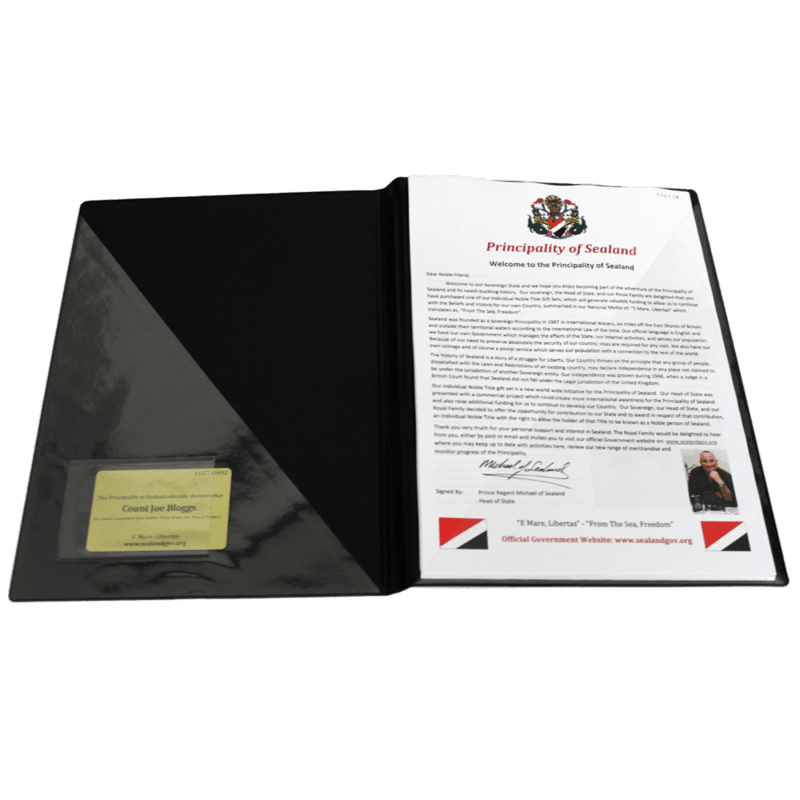 Your Official Title Pack will include a Framed and Personalised Individual Noble Title Deed personally signed by Prince Regent Michael of Sealand, a personalised proof of Title Gold Card and all your Official Documents will be presented in an elegant folder. You will also receive an abundance of information about your new homestead; including information on the Principality of Sealand, the location and history of Sealand, photos of the Principality and its Royal Family, a complete World Fact book entry, a structure of the Government and biographies of Prince Roy, Princess Joan and Prince Regent Michael. If you think you deserve our highest ranking title of Sealand or are searching for an extremely unique gift for someone special, the Duke or Duchess Title is the perfect, exclusive gift. Ordering your title pack is quick and simple and we will grant you with the privileged title as soon as we can. What Is The Difference When Purchasing A Duke Or Duchess Title Compared To Other Titles? Our Duke and Duchess titles are the ultimate titles of nobility, they are the highest title we offer to the public, only suited to the most deserving and prestige. I Have Ordered A Duke Or Duchess Title For A Gift But It Won't Arrive In Time. What Can I Do? Although we only offer standard delivery we provide all of our title purchases with a free online PDF version for immediate use. Also ideal for using on social networking sites to show off your new title. How Long Does It Take For Duke And Duchess Titles To Be Delivered? All of all orders take between 5-10 days to be delivered to the recipient. This includes all UK orders as well as orders to Australia and the USA. Does My Duke Or Duchess Title Expire? 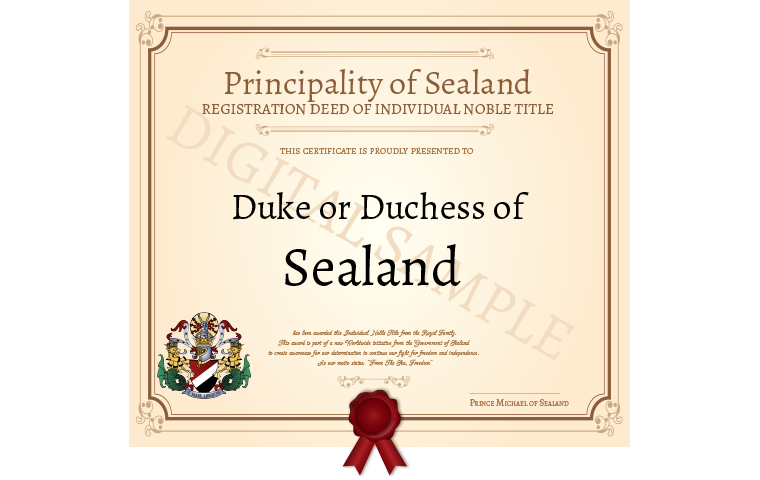 Our titles have no expiry date, your Duke or Duchess title will be valid throughout your entire lifetime and you will always be an important part of Sealand. Are There Records Kept Of All Duke And Duchess Titles Purchased? Yes, Sealand keeps a record of all Duke and Duchess titles purchased but only the Sealand Royal Family have access to The Royal Register. What Is Included In My Duke Or Duchess Title Pack? 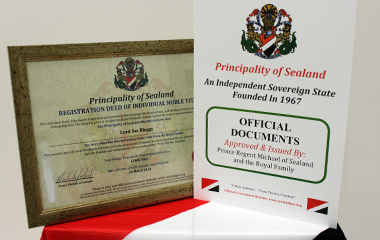 You will receive a framed, personalised and signed noble title deed, a proof of title Gold Card, information of the location, government structure and history of Sealand. Also included are photos, biographies and a complete world fact book entry, all presented in an official folder.